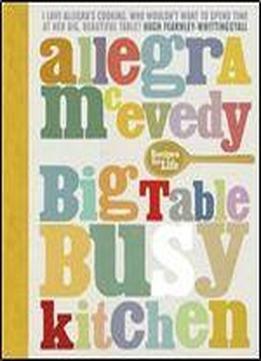 Big Table, Busy Kitchen is the ultimate celebration of food, home, love and life by renowned chef and bestselling food writer Allegra McEvedy. Inspired by her mother's handed-down recipe collection, the source of so many happy meals and memories, Allegra lovingly created this extraordinary cookbook not only for her own daughter but for all families to turn to and treasure through a lifetime of cooking and eating. This is a delicious journey through 200 glorious recipes, from first bakes to first loves, feeding the family to feeding your friends, compulsory veg to nursery puddings and everything in between. With recipes that are as achievable and delicious as they are inventive and engaging, accompanied by stunning photographs, vibrant page design and charming hand-drawn illustrations that will make you smile, this is everything a family cookbook should be. Chapters include: It Begins with Baking / The New Worker / Just the Two of Us / A Bun in the Oven / The Art of Entertaining / A Week of Sundays / Soup Theory / Nursery Puds.